The Very Large Array radio telescopes operation is located about 50 miles West of Soccoro, New Mexico. Now, I always think of saguaro cactus when I see the name because I pronounce them the same way, even though saguaro cactus (the tall skinny tree like cactus often used in Mexican art), don’t generally grow in New Mexico. Anyway, Soccoro is a lovely medium sized (for New Mexico) city, south on Interstate 25 from Albuquerque about 50 miles. We had a delicious lunch there at the Soccoro Springs Brewing Company. We sat in the bar area where the open beam ceiling is decorated with shoulder patches from police and fire departments from all around the United States. We decided that the Chicago Police Department patch was one of the best designs because it was an easily read blue lettering on white background. The smallest easy to read patch was a pie-wedged shaped design for the New Mexico State Police with minimalist black lettering on a yellow background. Kudos to those designers who let people know whom they are talking to immediately. Back to the VLA (Very Large Array). I was unable to take pictures because I only brought my cell phone and forgot to remind Bob to bring a camera. They require us to turn off our cell phones and other radio equipment so as not to interfere with the readings. The car radio had been off for about 30 miles as we lost all signals about the time we hit Magdelena, NM. This photo is a scan of a postcard made from a photo taken by Alexander Savello, a 2008 NRAO Summer Intern at the facility. The guided tours are on the first Saturday of the month. The array has twenty-seven radio antennas that tower eighty-two feet above the railroad tracks used to move and position them. A very productive astronomical research tool, the data from each antenna is combined electronically to simulate an antenna twenty-two miles in diameter. Radio telescopes detect radio waves to infrared rays in range – the lower end of the light spectrum – undetectable to the human eye. With the VLA, astronomers have detected water in a galaxy eleven billion light-years away from Earth. There is a 20 minute video narrated by Jodie Foster. We were assured that, although the monitoring station has since been remodeled, at the time the movie, Contact (starring Jodie Foster) was made, the monitoring station looked exactly like the set used in the movie. The video is a good introduction to the uses of the information gathered by the VLA. And the music playing as they display lovely sunsets and sunrises as backdrops to the radio wave telescopes is inspiring. Thus my comparison to a modern-day Stonehenge. When I visited Stonehenge with my mother over thirty years ago, I remember thinking how much more impressive it looked on TV with the music playing in the background. And since both sites are dedicated to learning more about celestial bodies, I thought the comparison was germane. 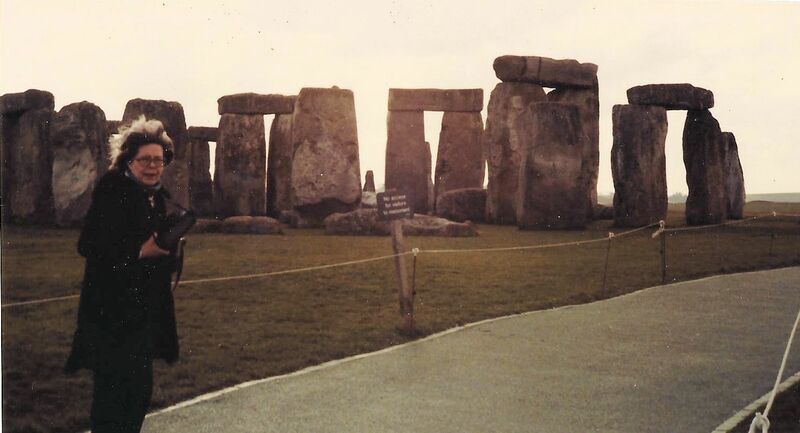 This picture shows my mother in the foreground and Stonehenge in the back. Both Stonehenge and the VLA were definitely worth the trips to see in person! This entry was posted in Air & Space, family, genealogy, movie, museum, outer space, photos, travel. Bookmark the permalink.